Frogs are the only native amphibians in Australia and they occur in a wide variety through most types of habitat. Sadly, many species of frog are under threat from climate change and fungal diseases. 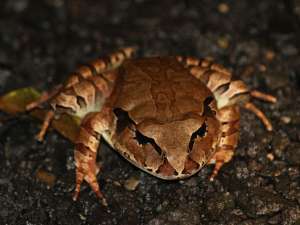 Another problem is the introduction of the Cane Toad, which not only displaces many frogs from their native habitats, but even eats smaller frogs. M. J. Tyler and F. Knight, Field Guide to the Frogs of Australia, 2nd edition, 2011.